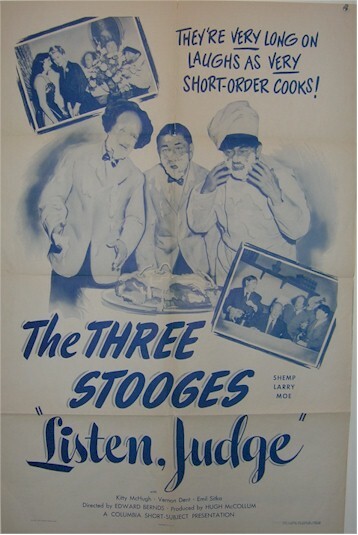 1952 - A very RARE Three Stooges vintage one sheet with a spectacular images of the boys. . The Stooges are repairmen who wind up in court on a vagrancy charge. They are released on lack of evidence and are soon hired to fix a lady’s doorbell. Their work annoys the chef, the butler and waiter, causing them to quit. The woman next hires the Stooges for her husband’s birthday party. Their explosive cake lands all over her husband, who then recognizes them, since he was the judge who tried them. A real Beauty vintage Stooge one sheet with exceptional graphics and artwork. With the rise in early Stooge movie posters reaching the six figure value range, this is no doubt a great opportunity and exciting investment. This is the FIRST time we have seen this title on the market. Very good condition with minor wear.